Just about any plant site you go to, you’ll find scrap bin full of tubing that has not been bent correctly. The purpose of this CTE series on tube bending is to help minimize that waste, cut cost, and to help you become more efficient when bending tubing. There is more to tube bending than just bending, however. In order for proper and safe operation a technician should have a basic understand of tube fabrication, fitting makeup, and the importance of precision in bending the tube. 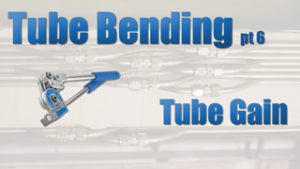 In this CTE series on Tube Bending, we’ll cover topics such as Tube Selection and Design, Tube Cutting Methods, Tube Bending Preparations, Proper Use of the Bending Tool, Making the Actual Bend, Bend Direction Marks, Tube Gain and Tube Gain Calculations, Changing Planes and Tube Orientation, as well as Fitting Types and Assembly. 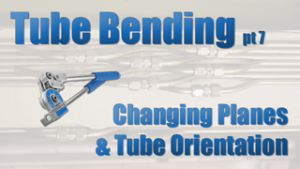 Before jumping into tube bending we first need to understand more about the tube itself. Selecting the proper material and design of the tube is critical for proper operation and safety. Some of the topics we’ll cover in this video will be matching materials, tubing hardness, fitting designs, wall thickness, chemical and temperature compatibility, tubing surface, tubing storage, support, routing, and spacing. There are multiple ways to cut tubing but they won’t all work in every situation. There are pros and cons to consider for each. Some of the methods for cutting the tube include a hand tube cutter, a hacksaw, or a chop saw. 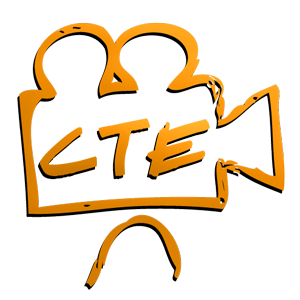 Watch and found out which tools work best in each circumstance. Before we bend a tube there are certain steps we must take in preparation and it’s helpful to know what will happen to the tube itself during bending. You’ll also need to understand the proper operation of a Manual Hand Tube Bender as well as how to measure the tubing and how to plan out the tube line. You should now have a better understanding of the tubing itself and the basic operation of a tube bender. Now we can begin to measure and start the bending process of fabricating a tube line. 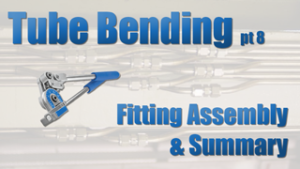 This video will cover measuring and marking the tube, placing the tube in the bender, making the bend, checking for square, improper tube bending, proper tube bending, proper 90 degree bends, and measuring the tube center line. Most tube lines will not be limited to just one bend. There will be many items and obstacle you will have to work around. 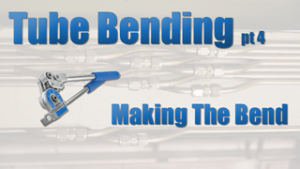 In this CTE video we will explore the many things you will need to consider in making multiple bends in your tubing line. Some of the topics discussed will be making the proper measurements, adding a bend direction mark, proper tube alignment, making the bend, and checking the angularity. Most tube lines will not be limited to just one bend. There will be many items and obstacles you will have to work around. In this CTE video we will show you a third bend in this tubing line and explore the many things you will need to consider in making multiple bends in your tubing line. Some of the topics discussed will be making the proper measurements, tube gain calculation, proper tube alignment and preparation, making the bend, and checking the angularity. Most tube lines will not be limited to just one bend. There will be many items and obstacles you will have to work around. To this point in the CTE Tube Bending series, we’ve been bending on only one plane. In this video we’ll do our final bend but this we’ll show you how to do it on a different plane. Some of the topics discussed will be making the proper measurements, tube orientation, changing planes, proper tube alignment and preparation, making the bend, and checking the angularity. Tubing is just tubing if it isn’t working together with instrumentation and different systems. It would also be impossible to fabricate the tubing line with just one piece of tubing. Each piece of tubing will need to be connected to the next piece. In order to do that we need tube fittings. These fittings must be precisely used in order to function properly and to create a gas tight seal. In this video we will cover topics such as component orientation, tube insertion, makeup procedure, port connectors and plugs, remake procedures, and fitting performance and troubleshooting.